Often we hear about technology being the savior of all our problems in education or the culprit. It is either the solution we’ve been waiting for or it is contributing to education’s demise. Where technology is concerned, beauty is in the eye of the beholder. Each teacher looks through the lense of their educational philosophy and they see an instrument that can further their vision. If you have a Skinnerian view of learning than using computer time as a reward or finding games to play on the computer with a reward system is right up your alley. If you believe in the Constructivist learning theory then you are looking for ways that technology can help students construct new knowledge and ideas, direct their own learning and create. In short, their’s an app for all of that. If you are primarily relying on skill and drill methods there are many shoot ’em up apps that will help your students memorize their facts. If you are interested in apps that encourage students to problem solve, grapple with concepts, create and direct their own learning, the sky is the limit. With the iPad taking schools by storm, many are wondering how the tool will be used to further education? HOW is the big question, and many teachers are finding it is the perfect instrument for Constructivist teaching. 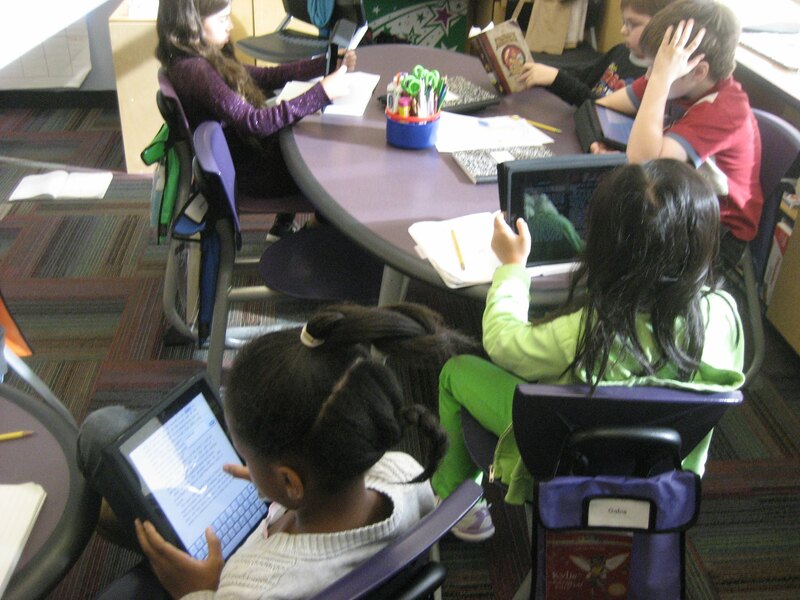 Beyond flashy apps, are the iPads‘ native functions that make learning more student centered than ever. Want to zoom in? Open your fingers and get a closer look. Want to find the definition of a word? Tap on it and press define. Want to read more fluently? Increase the text size. Have a question and want to find out the answer right away? Search on google. The possibilities for learning are endless. Isn’t this what we call differentiated instruction? Can learning be anymore personalized when the only thing between knowledge and your mind is the tip of your finger? As teachers who try to foster environments in which Constructivist learning can take place, what better tool for elementary age children to construct their own knowledge than an iPad? One of the greatest assets of the iPad is its size. Teachers can integrate technology in an unobtrusive way amongst the other educational tools they are already using. Math manipulatives, crayons, musical instruments and the iPad can all share the same table space and be used for different purposes. Don Buckley, Director of Technology at The School at Columbia University, realized this early on when last year he replaced all of the laptops in the primary division with iPads. In fact, many schools are even skipping the investment in Smartboards and just buying an iPad, a projector and an app called Doceri. Reading: Using the Kindle or iBooks app there is no better reason to use the iPad then for it’s reading functions. Each student can adjust the text size to what is “just right” for them. Type notes, look up the definition of an unknown word, highlight, underline, even google a word or phrase. Present: In Keynote, create presentations with this app on your iPad. No computer required. Whiteboard: The app ShowMe records each stroke of your finger and your voice. Allowing even kindergartners to share a solution to a math problem, explain it and play each step back for you. Discuss: Use skype, Edmodo and a variety of apps to have discussions with other students in your class, other schools, cities and countries. Notebook: There many notebook apps such as Penultimate and Notable that would allow teachers to take meeting notes, student anecdotes, running records, teacher conference notes, you name it on the iPad. Why stop there? Students can use one of these apps as their Writer’s Notebook, Math Notebook and Science Notebook. With customized papers, students can even write music on sheet music paper!